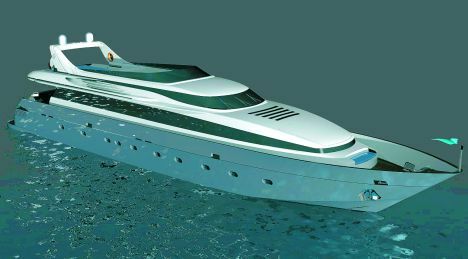 CNL will launch a new "ADMIRAL 35" to add to its series of non displacing motor yachts with the same clean exterior design and balanced shapes which have characterised the rest of the fleet. Completed entirely in 5083 aluminium, the Admiral 35 has modern interiors both in layout and in the materials used. Guest and crew cabins are situated on the lower deck. The guests dispose of 4 cabins, two double ones and two with horizontally separated berths, each with an ensuite bathroom. The crew's quarters are made up of a captain's cabin, and two other cabins for crew members together with a galley and saloon. The master cabin is located on the main deck and its large volume is divided into a walk in cupboard, an ensuite bathroom, a relaxing area and an office space. Stern of it, on the same deck, there is the dining area with an adjacent main saloon with adequate seating, coffee tables and an audiovisual system for entertainment purposes. The external cockpit has a comfortable sofa matched to a table and four small armchairs. On the deck above, at mid-ship, there's the wheel house with the latest technical equipment. The flying bridge hosts the second set of steering controls as well as a large area reserved for relaxing. In this zone in fact there is an ideal area for eating out in the open, astern of which there's a sunbathing area for sun lovers as well as a Jacuzzi. To create such a large space on the flying bridge, room was made for the tenders at the bows and in a special hanger, at the bows. For futher information: CNL - Cantieri Navali Lavagna, Lavagna; via dei Devoto 197; 16033 Lavagna (GE); tel.+39. 0185 300341; fax: +39. 0185 306601; web page: www.cnl.it; email: info@cnl.it. Class. ABS- Maltese Cross A1.- Yachting Service, AMS,MCA compliance.